The Battle of Tarvis was fought during March 21-23, 1797 near present-day Tarvisio in far northeast Italy, about 12 kilometres (7 mi) west-by-southwest of the three-border conjunction with Austria and Slovenia. In the battle, three divisions of a First French Republic army commanded by Napoleon Bonaparte attacked several columns of the retreating Habsburg Austrian army led by Archduke Charles, Duke of Teschen. In three days of confused fighting, French divisions directed by André Masséna, Jean Joseph Guieu, and Jean-Mathieu-Philibert Sérurier succeeded in blocking the Tarvis Pass and capturing 3,500 Austrians led by Adam Bajalics von Bajahaza. The engagement occurred during the War of the First Coalition, part of the French Revolutionary Wars. After Bonaparte's capture of the fortress of Mantua in early February 1797, he cleared his south flank by crushing the army of the Papal States. Reinforced with forces from the Rhine front, Bonaparte was determined to drive the Austrian army from northeast Italy. His offensive began in March and consisted of a secondary drive through the County of Tyrol by Barthélemy Catherine Joubert's left wing and an eastward thrust by Bonaparte's main army. The main French army soon drove the archduke's forces into headlong retreat while Joubert battled with Wilhelm Lothar Maria von Kerpen in the Tyrol. Charles tried to hold the Tarvis Pass against the French by sending three columns of reinforcements, but they found the pass held by Masséna's French forces. While many Austrian troops fought their way out, the last column was trapped between three converging French divisions and compelled to surrender. A subsequent advance brought the French within 75 miles (121 km) of the Austrian capital of Vienna. In mid-April, Bonaparte proposed and the Austrians agreed to the Preliminaries of Leoben. Most of the terms were ratified by the Treaty of Campo Formio in October 1797, ending the long war. General of Division Napoleon Bonaparte was not present for the capitulation, having left a few days earlier to press the war against the Papal States. 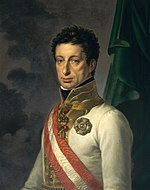 Following instructions from Bonaparte, General of Division Jean-Mathieu-Philibert Sérurier refused to amend the initial French surrender proposals. At length, Wurmser acquiesced and accepted Bonaparte's terms. Columns of disarmed Austrians marched out of Mantua on 4, 5, and 6 February. Meanwhile, important events were taking place elsewhere. On 3 February, a 9,000-man French column under General of Division Claude Perrin Victor crushed a 7,000-strong Papal States force led by Feldmarschall-Leutnant Michelangelo Alessandro Colli-Marchi in the Battle of Faenza (Battle of Castel Bolognese). For the loss of only 100 men, the French inflicted 800 killed and wounded on their enemies and captured 1,200 soldiers, 14 guns, 8 colors, and 8 caissons. On 9 February, the 1,200-man Papal States garrison of Ancona surrendered to Victor. Bonaparte soon forced the Pope to agree to the Treaty of Tolentino, compelling the Papal States to disgorge 30 million francs. During 1796, the campaign in Germany had received priority in terms of French troop reinforcements. But after a significant lack of success in the Rhine theater, the French government in Paris belatedly decided to send reinforcements to Italy. Generals of Division Jean-Baptiste Bernadotte and Antoine Guillaume Delmas were transferred to the Italian front with their troops. Although the new Austrian commander in Italy, Feldmarschall Archduke Charles, Duke of Teschen had 50,000 troops, they were distributed over a wide front. Bonaparte was determined to attack Charles before the Austrians were ready. Having 60,000 men available, Bonaparte planned to attack through Friuli with two-thirds of these troops. The French commander posted General of Division Barthélemy Joubert with about 20,000 troops to protect the Tyrol against a possible Austrian attack in that quarter. If no threat developed, Joubert was ordered to rendezvous with Bonaparte in the Drava River valley. With General of Division Pierre Augereau on leave, General of Division Jean Joseph Guieu assumed command of his division. Generals of Division André Masséna, Bernadotte, and Sérurier also marched with Bonaparte's main body. At the end of February, the French advance began with he crossing of the Brenta River. The weather enforced a suspension of operations, but on 10 March, the French drove forward again in two columns. Bonaparte took 32,000 troops through Sacile, aiming for Valvasone. Guarding the left flank were Masséna and 11,000 more men. Charles deployed his main force between Spilimbergo and San Vito al Tagliamento. On the 14th, Masséna clashed with a small force of Austrians under General-major Franz Joseph, Marquis de Lusignan. Meanwhile, about 300 kilometres (186 mi) to the west, Joubert and 18,000 men clashed with Feldmarschall-Leutnant Wilhelm Lothar Maria von Kerpen's 12,000 troops on 20 March at St. Michael, near present-day Salorno, Italy. Kerpen's Austrian force included five battalions in two regular infantry regiments plus elements of a third, three squadrons of dragoons, and 5,000 Tyrolese militia. In the battle, Joubert's troops routed their opponents inflicting losses of 300 killed and wounded plus 3,500 captured, while suffering 200 French killed and wounded. Smith, Digby; Kudrna, Leopold (2008). "Kerpen, Wilhelm Lothar Maria von". The Napoleon Series. Retrieved 18 September 2012. Smith, Digby; Kudrna, Leopold (2008). "Köblös de Nagy-Varád, Samuel". The Napoleon Series. Retrieved 18 September 2012. Sargent, Herbert Howland (1895). Napoleon Bonaparte's First Campaign: With Comments. Chicago: McClurg & Co. This page was last edited on 1 December 2018, at 19:41 (UTC).